The truffle hunter, much like his cousin the porcini hunter, is a lone beast. 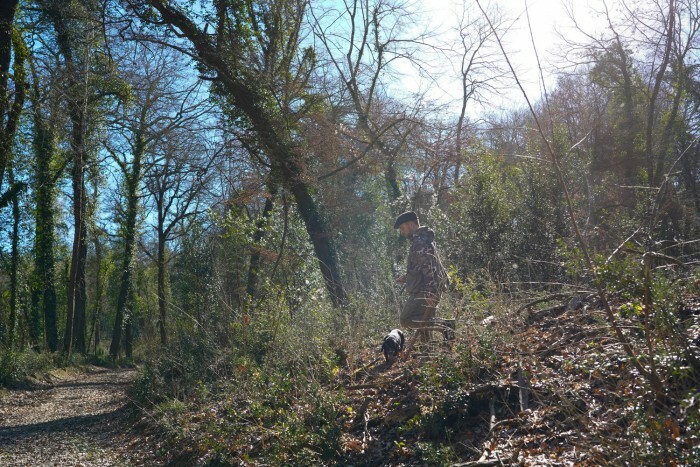 Out at the crack of dawn with his faithful dog, armed with a spade and dressed in camouflage, he moves under cover of darkness so that nobody finds out where he searches for the precious subterranean fungus. He spreads the aromatic equivalents of landmines to throw rival beasts off track, doing everything to protect his livelihood, for bringing in a precious edible of sufficient size can feed his family for a week. 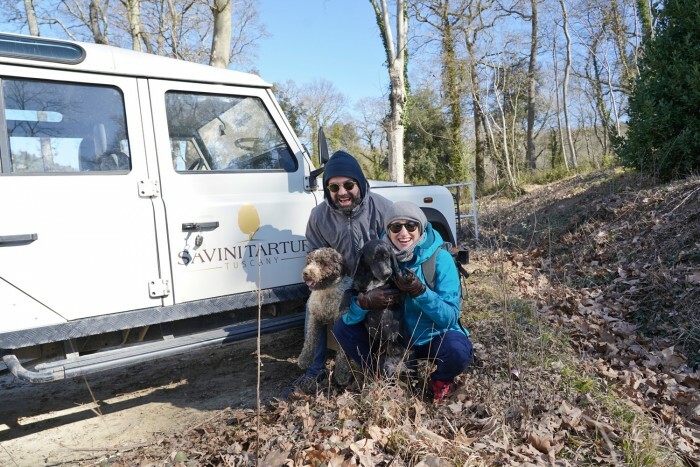 Luckily, the folks at Savini Tartufi, Italy’s largest truffle trader, are willing to share their secrets (or at least in specific locations). 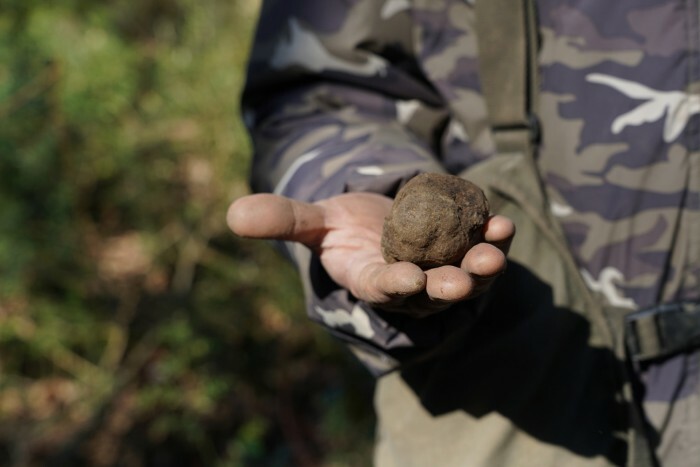 We set out to the province of Pisa recently to test their “Truffle Experience” and I can finally say that I’ve been properly truffle hunting in Tuscany and eaten the results. 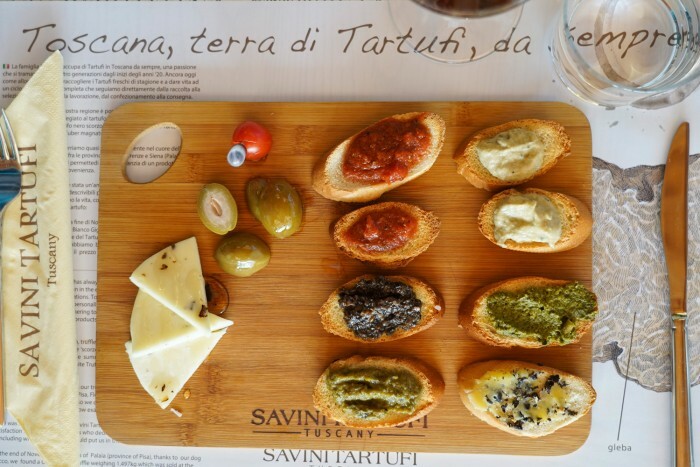 Savini Tartufi is a fourth-generation family-run company. It all began with Zelindo Savini, who was game warden at a villa near Palaia, in the Pisan Valdera. The fragrant objects his dog found in the woods were a favourite of the villa’s wealthy Northern Italian inhabitants, who were already familiar with the French truffle tradition; they keyed Zelindo into the idea that they could be sold as a high-priced delicacy. As the market grew, he opened bottega in Forcoli; his son Luciano worked alongside him and developed methods of conserving the precious fungus, creating a line of products that you can still buy today, in a much expanded version. Now Savini is made up of a network of a few hundred freelance “hunters” who bring in tartufi every morning; these are weighed, cleaned, and evaluated. The best will go to Michelin-starred restaurants or be flown immediately to Japan, while others will be chopped and mixed into preserves, cheese, meat, honey, even chocolate. To give you an idea of scale, Savini processes a few tonnes of tartufi each year for 10 million euros of revenue and exports to forty countries around the world. We arrived at the family’s modern warehouse in industrial Forcoli, 20 minutes from the superstrada, on a Saturday morning. Inside, there’s a little museum, store and tasting room. Tartufi, our guide Andrea explained, don’t last very long: you’ll want to consume that morning’s catch within three days. 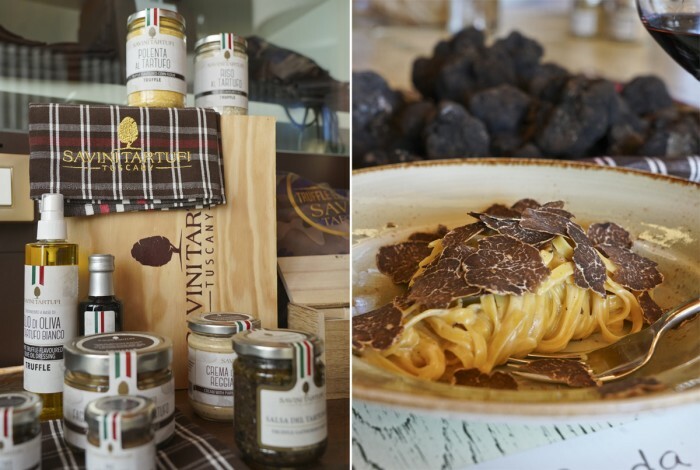 We got a quick lesson in the main types of tartufi and when and where to find them; some, like the precious white truffle, are only found September through December and go for €3500 a kilo, while the more common black scorzone can be cultivated under white poplar trees. Our small group piled into a Land Rover and headed to the nearby woods, one of three locations Savini’s guides bring visitors on rotation (tours run daily, so they have to be careful not to exhaust the source). Keeping Tommaso and I company this winter Saturday was a couple from Milan celebrating their anniversary and a family from Florence – Andrea, the dad, is a tour guide who often brings people here and wanted to share the experience with his wife and daughter. First to jump out of the car are Giotto Junior and Birba, our four-legged local guides. 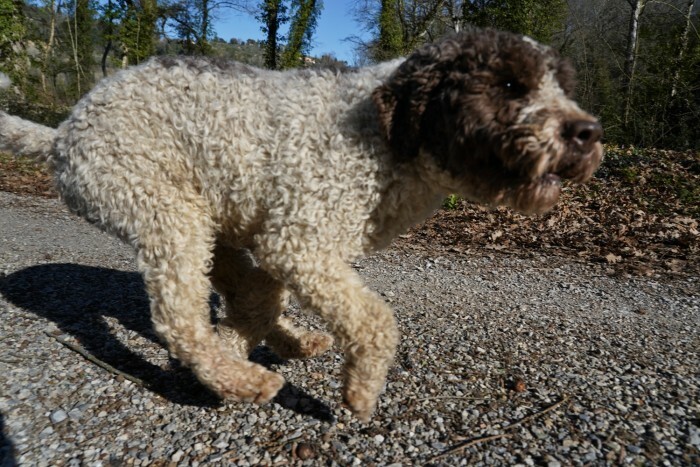 Giotto Junior is a curly-haired Lagotto Romagolo, who are generally bred as truffle-hunting dogs. Named for the founding father’s favourite dog, Giotto Junior is all show, but Birba, a short-legged mutt, is all business. She’s got female wisdom and a few years on the adolescent Giotto. Nose to the ground she’s immediately at work, while Giotto is enjoying a walk in the woods and the attention of strangers. The two work in pairs, occasionally stopping to make a mess of some loose earth, making us think they found something when they didn’t. Not surprisingly, it’s Birba who catches a whiff of an Tuber Melanosporum buried quite far into the ground. She digs with joy and determination, and most brilliantly, she stops when told so that Andrea can safely extract our prize. The woods we’re in are light and well-tended. Oak trees soar above us, leaving room for Mediterranean scrub to grow below in the sandy ground. When the dogs drag us into it and I’m pricked by pungitopo (Butcher’s broom, similar to holly), I’m quite happy for my long pants and hiking shoes. Not to be outdone by a lady, Giotto found our second tartufo of the day, slightly less fragrant and more past its prime than the first. The two dogs work in tandem to dig it out. 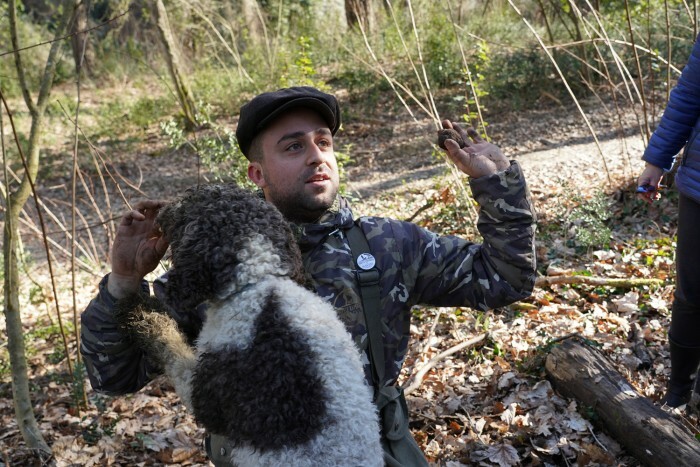 For them, it’s a game they play every day and their reward is the dry dog treats that Andrea keeps in his vest, the traditional three-pocketed vest of the Tuscan game hunter. While they love truffles, a good truffle dog won’t eat or even bite the fungus. We’ve worked up an excellent appetite, just in time to head back to our home base. 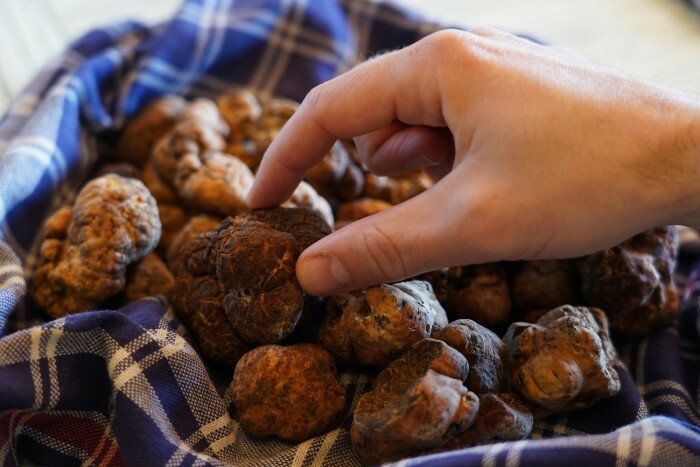 The truffles Giotto and Birba have found for us weigh 87 grams, bringing in about 90 euros on the market. 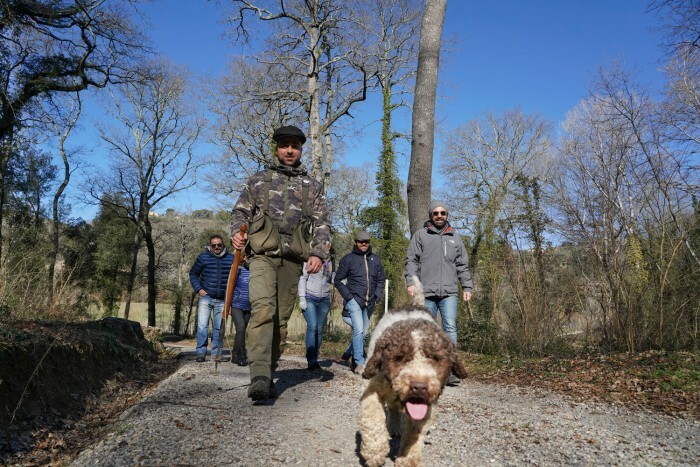 We sit down at table all together and conversation strikes up – before this, we’d been concentrated on the dogs and the task at hand, but as tartufo dishes come out and are washed down by the family’s superb house wine (a super smooth Bordeaux-style wine), we get to know our neighbours. We sample many of Savini’s famous bottled products on toast, but the primo is what wins me over: fresh tagliolini with a ton of tartufo on top. This is followed by egg with tartufo, and there’s even tartufo gelato. Meanwhile, Andrea entertains us with more stories, and also brings out the day’s load of truffles for us to observe and photograph. This is the freshest you’ll ever taste truffles; ingredients and preparation are basic in order to exalt the flavours, and they don’t skimp on the portions. By the time we’re done, I think I never want to eat or smell truffles again, though Tommaso enthusiastically buys out the bottega. Disclaimer: I was hosted for free on this tour and have chosen to write about it as I honestly enjoyed the experience!